This year there haven’t been the usual plethora of ‘health and safety gone mad’ articles that always lead up to street parties. Someone, somewhere has told the councils to back-off (at last!). It’s meant that people have held some great events which, in spite of the weather, still pull people together, and all around my favourite subject, food! Any excuse for a party and bartlett mitchell will roll up their sleeves. This year has been a great opportunity to bake like never before and even get our customers involved by inviting them to take part in a bake off. We’ve had a fantastic time as the pictures show and our customer feedback has been amazing. But where did this tradition start? The street party, a quintessentially British affair, is not a very old tradition. The first recorded ones seem to be after the signing of the ‘Treaty of Versailles’ in 1919. They were first called ‘Peace teas’. These were nationally organised events but I think they stem from a tradition established in the Georgian period for the rich to hold very formal, outdoor lunches. I read of a particularly famous occasion when the night before the statue at the top of Nelson’s Column was put in place, a group of 16 gentlemen had a served roast beef dinner at the top! It’s interesting that the first parties were held in times of austerity during 1919 and again in 1953 when rationing was in place. 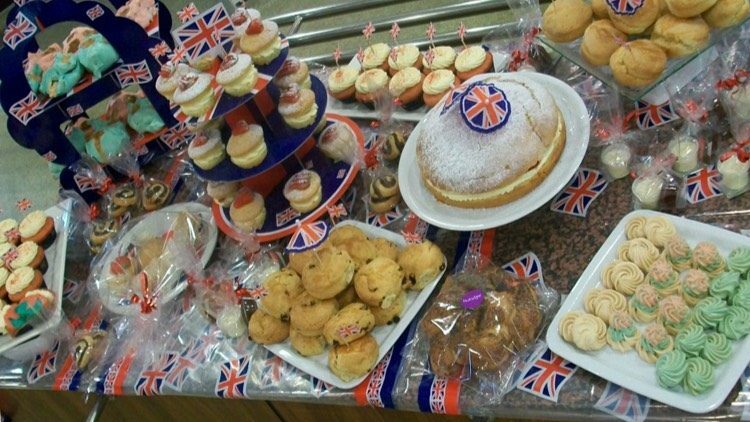 For the Queen’s coronation party, households were given an extra pound of sugar and a half pound of margarine to help bake. Since those times, and as our society has become more multicultural, the food on the street party table has become more ‘adventurous’. Shipham’s paste and tongue sandwiches have fortunately been replaced with barbeques and international pots of curries and stews. One of the great things about the street party is the opportunity for communities to become closer. Anything that brings people together gets my vote, especially if it’s food!